A struggling screenwriter inadvertently becomes entangled in the Los Angeles criminal underworld after his oddball friends kidnap a gangster’s beloved Shih Tzu. BEFORE: Tonight’s advanced screening is provided courtesy of Emerson College. Seven Psychopaths is being shown at the Bright Family Screening Room which, if I recall, is much smaller than an average theater1. Featuring a large ensemble cast including Colin Farrell, Sam Rockwell, Woody Harrelson (last seen in Rampart), and many, many more. Based on the trailer, the film looks quite bizarre although I’m unsure whether that will be good or bad. AFTER: When I said that trailer made the film look bizarre, I had no idea just how bizarre it would actually be. And boy does it work to the films advantage. Seven Psychopaths as the name might hint to, is by no means a typical or normal film. Sure it has a beginning, middle, and end, but it also states standard films conventions and then breaks them. Like what The Cabin in the Woods did to the horror genre, Seven Psychopaths does to the film industry in general. The writer and director, Martin McDonagh, makes a bold move openly stating that Hollywood has lost much of its originality and bashes many plot lines that are in his own film. It’s bold, but McDonagh follows through, executes well and the result is one hilarious comedy. Not all comedies are created equal. Some can be funny because there are great jokes written in. Pitch Perfect is a good example of this; the comedy is thrust in front of the viewer and is obvious what is supposed to provoke laughs. Seven Psychopaths on the other hand is an example of another type of comedy; an intellectual and witty comedy. Sure, there are a handful of apparent jokes, but most of the comedy requires you to think a bit before the humor kicks in. A big part of this film’s appeal is its self-referential nature. This ties in with what I said earlier about McDonagh stating limitations and problems with new films in general and his film specifically. While not a perfect comparison, it reminds me a lot of the television series How I Met Your Mother. There are many ongoing gags brought up early on and then forgotten about until the end. Like the slap bet or the yellow umbrella in HIMYM, Seven Psychopaths has a promise made to a psychotic bunny lover, a barely mentioned Vietnamese man, and a foreshadowed ending. Martin McDonagh deserves a lot of credit for the writing and overall style of the film, but a lot of credit must also be given to the cast. There really isn’t one standout actor, but combined, the cast delivers a knockout performance. In addition to the aforementioned Farrell, Rockwell, and Harrelson, Christopher Walken, Abbie Cornish, Olga Kurlenko, and Željko Ivanek (last seen in Argo) round out this quite large ensemble. A few days ago, I wrote a large reflection piece where I summarized the top films I’ve watched over the past three months. Pitch Perfect handily took the spot for Best Comedy. 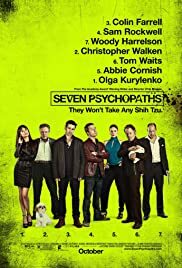 Because of its unique style, intellectual humor, and fantastic cast, Seven Psychopaths easily trumps the teen musical as my new favorite for Best Comedy. You should put this on your must see list immediately for a truly fresh and original film. Seven Psychopaths opens in theaters on October 12, 2012.